On this page you will find information about the webmasters and details of the site and what you can expect to find in the pages as you browse around. 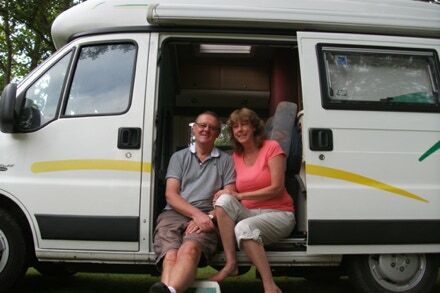 Hello and welcome to our website, we are Graham and Pauline we have been camping since we got married in 1975 we have just about used every camping unit you can think of, tents, trailer tents, caravans, motorhomes etc. In 2000 we were happily towing our caravan on the M42 when it started an uncontrollable snake and we ended up being pulled by the caravan off the motorway and up an embankment, the car landed on a crash barrier and the petrol tank was leaking petrol all over the place, the caravan was on its side and a complete write off. Thankfully we were unharmed but understandably this put us off towing but we wanted to carry on camping, it was then that we first saw a Romahome C15 small motorhome which we thought was ideal for us to use as a dual purpose vehicle. We fell in love with our Romahome and Pauline at that time was learning how to build websites so she started this website, gradually over the years we have been adding pages and a forum. Although this site is based on our experiences of camping in our Romahomes we hope it will also provide useful tips and information for campers using any other small motorhome, large motorhomes, tent camping or caravanning. • Information on other small motorhomes and self build vans. • Recipe pages for tried and tested recipes which can be cooked easily in a small motorhome or unit with limited cooking facilities. We also have a very active forum - Small Motorhome Forum - where you can chat about all types of camping, get advice, ask questions, buy or sell your vans or equipment or just have fun, a chat and make new friends. Use the navigation links on the left to find your way about. Whether your choice is a small motorhome, a big motorhome, a caravan or tent - may you enjoy Happy Camping! Bon Voyage. If you would like to contact us please email sitemail@smallmotorhome.co.uk with any questions we will get back to you as soon as possible. If you have found the information on here of help please consider making a donation by clicking on the button on the right to help us fund our running costs, every little helps. You can also help when shopping here shop and help. Pauline (webmistress), Graham (webmaster) and of course our Romahome, without whom this site would not have been possible.